A good bath refreshes our body and mind and a nice bathroom adds to the pleasure of having bath. 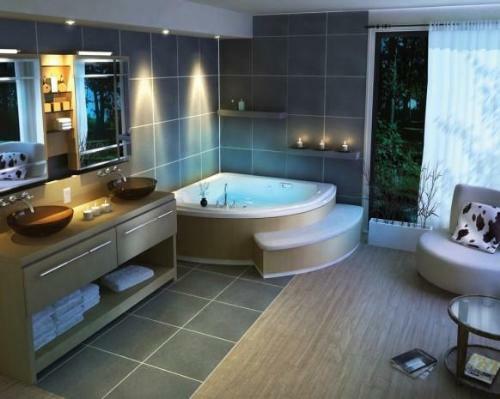 A good bathroom lets you enjoy real bath and makes you ready to work for the day. To enjoy true bath you need a well decorated bathroom. A bathroom can be said heaven of the earth where exists refreshment, coolness, amusement, peace and harmony. Lets discuss various aspects of a bathroom. Bathroom should be illuminated with proper lighting so that one could clearly see ones face while taking bath or applying makeup. Bathroom lighting should illuminate even the smallest object of bathroom clearly. Right lighting helps you feel fresh when you are taking bath. There is a large variety of vanity lights and mirror lights ranging from contemporary lights to traditional bath lights. Bathroom lighting fixtures should be placed at such heights that they could light up your faces without showing any shadow under your eyes. Always make a choice for incandescent light fixtures or bulbs that illumine your face clearly. Eye-catching color schemes make your bathroom look cool and refreshing. 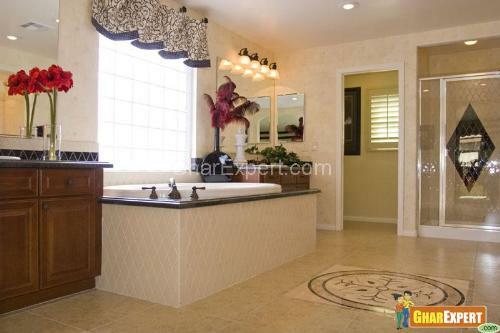 Color theme of a bathroom should be consistent with colors of walls, tiles, faucets and accessories. White color scheme is a good idea as it makes your bathroom appear fresh and go well with any colors or shades of the room. The white scheme blended with serene blue is refreshing to the eyes and body. You can add accessories to highlight color accents in bathroom. Intensive ventilation is required in bathrooms where a lot of moisture exists. Large windows are helpful in reducing the effect. To keep the place dry an exhaust fan is required for proper circulation of air. It is necessary to place the fan out of reach of moving hands while taking bath. Bathroom flooring should be nice looking, anti slippery, hard and durable. Its necessary to choose nice one for your bathroom. The floors must be damp proof. You need to pick up the right type of flooring. Vinyl tile flooring lasts long and is very easy to clean. 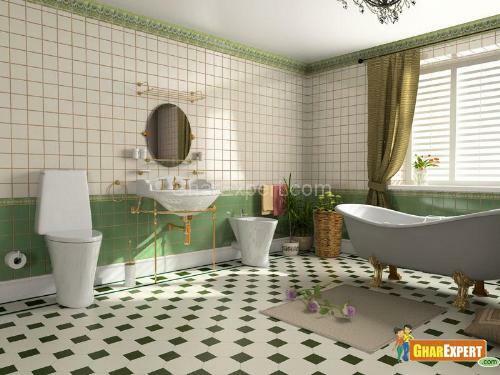 A large variety of colors, shapes and textures is available in tiles. You can choose any of them according to your fancy. Marble flooring is also durable and very easy in cleaning. This flooring gives fresh look and adds warmth to the interior of a home. Bathroom cabinets are ideal to place the stuff. These preserve the dcor of the room and are available in a range of designs and shapes like antique, classic, and contemporary. You can pick any of them that match up with the dcor of your home. These add uniqueness to the space and often come with a sink. Sinks are available in a large variety from stainless steal, porcelain, glass, marble or even granite. Glass shower doors are one of the most important choices these days. These are hinged at the one side and often swing in both directions. The shower doors look cute and classy. These doors are available in large variety of designs. 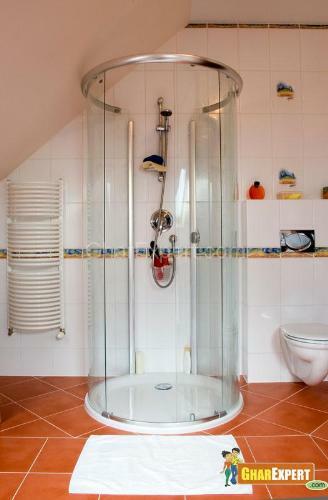 Folding shower doors help to retain water inside the bath area. The main advantage of glass shower door is easy and quick clean up. This shower door prevents hard water stains on shower glass. Sliding doors are perfect choices for small bathrooms. Glass shower doors come in a variety of finishes like nickel, chrome, brass or many more. You can pick any of the themes that match up with theme of your bathroom. You can either go for custom made shower doors that look quite contemporary or for traditional shower doors having shelves and seats. Corner shower units are perfect choices for basement bathroom areas. In modern bathrooms, glass shower enclosures are taking place of the showers in the tub. These shower doors add warmth to the beauty of your bathroom and let natural light to enter the bath area. You can go for any of engraved or clear glass for more private feel. Thus you can naturally enjoy the bath. The rods are attached to the wall or ceiling above your bath tub to support the curtains of shower. These are usually screwed into the walls. Shower curtain rods are available in various shapes or styles like L shape which is designed to fit around a corner shower over your bath tub. Its your choice to select curtain rods that match up with theme of towels and window curtains. Curtain rods add elegance enhancing the look of your bathroom. Nice shower curtains turn your bathroom into perfect oasis. It depends on you whether you select pedestal basin or cabinet basin. People mostly go for cabinet washbasins as they are useful for small bathrooms. Wall mounts washbasins look attractive, hung from the wall at a desired height. It must be ensured that the wash basin is compatible with faucets of the bathroom. Accessories are helpful in making a bathroom overwhelming. Right selection of accessories can make you noteworthy for the interior dcor of your home. 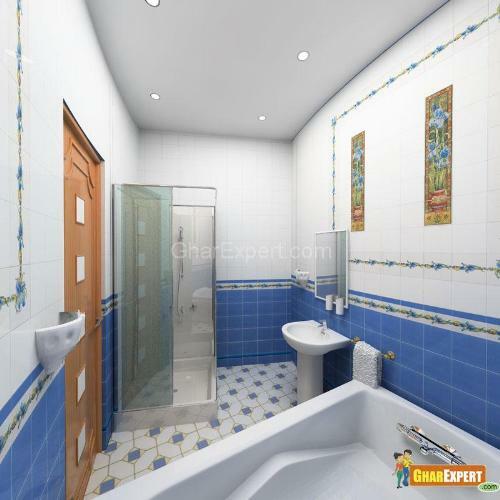 You can renovate your bathroom whenever you get bore of old ones. 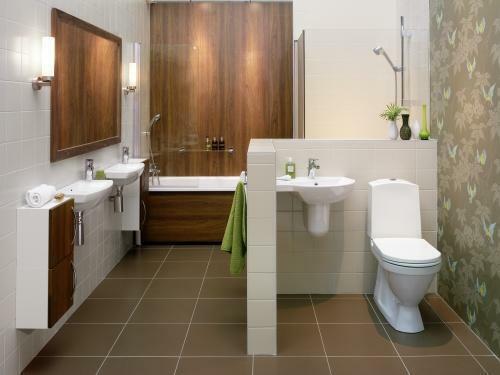 Bathroom Accessories of latest designs and styles play an imperative role in remodeling the room. Stay close to the theme of your bathroom for lighting and faucets. Go for same color lighting fixtures if you have brass faucets. 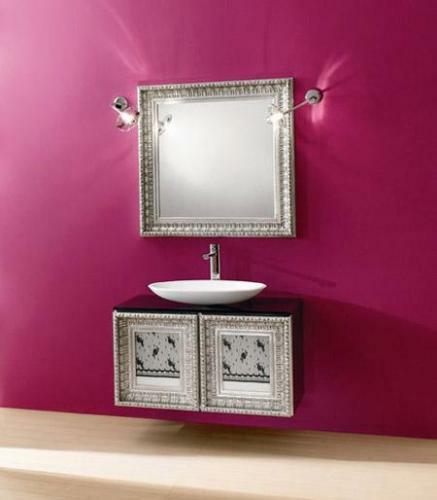 Provide enough storage space for cabinets and vanities which provide ornamental look. Wall cabinets and corner cabinets provide ample storage space. Make a choice for the theme of doors and windows similar to the home. Pick latest designs of accessories like faucets, lighting items, tiles and counter items if you want to create new look to the room. Consider the size of the area of your bathroom. Select fantastic bathroom cabinets for modern feel of the house. You can pick any of metal, laminated, glass or etc. Go for glass shower stalls and frameless door shower enclosures which present modern look. Accessorize your bathroom with chrome faucets and a number bathroom lighting fixtures ranging from antique to the most contemporary. Buy items or pieces according to the space available. Dont buy too large pieces for the area. You can definitely change the look of your bathroom with a lot of modern design ideas, accessories, lighting and fixtures. Thus you can naturally enjoy the bath.